What are the difference between different colored pearls? How do they get their different colors? I’ve seen black, pink, cream, even green. Are these real pearls? Pearls can naturally come in colors of blacks, greys, silver, creams, whites, pinks, yellow, brown, and gold. 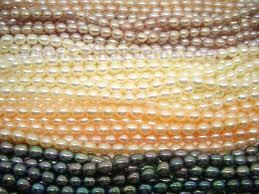 But a lot of pearls are dyed, irradiated (makes them darker and more iridescence), or bleached. A green pearl is definitely dyed, but even a white pearl could have been enhanced in a number of different ways. How do you know if pearls are real? I have a pearl necklace, its real long. It weighs a ton. They were my grandmother’s when she got married. She says they are real because they cost a lot, but I’m not sure. These pearls are maybe 35 years old. They’re a beige color most are different oval-circle shapes as you turn them or something. I’m thinking they might be fake because there is this ONE pearl that’s peeling near the part where you attach them. Do they put in some fake ones? Also there is this ONE that has a small dent. Actually just before I submitted this, I saw scrapes. Can they start peeling because of age? The irregular shape suggests that they could be real, however the peeling is quite worrying!! A trick I learned was to rub a pearl on your teeth not too hard and not to damage it! If there is a gritty kind of texture then yes they are real! Cultured pearls are very popular. They aren’t fake, just from oysters that have been bred in a kind of farm especially for their pearls! These are usually the same kind of shape like plastic ones which are usually all round. If they are quite old, then maybe dents could appear as pearls are not the strongest gems!! If in doubt it is always best to go to a reputable jeweler to be sure!! If it is real though, keep it safe!!! Natural pearls are quite rare now and the necklace could be worth some money.